It started with a piano that couldn't make it up the stairs. In 2003, in Sheffield, England, a grad student named Doug Pearman found himself unable to get his beloved secondhand piano up the stairs to his new flat on Sharrow Vale Road. Doug's cousin, Hugh Jones, a Cambridge-educated mathematician working as a cabinetmaker, suggested that they just leave the piano where it was. They tracked down a stool for it, stapled on a tarp for protection from the sudden South Yorkshire showers, and attached a sign inviting passersby to sit down and play, right there in the middle of the sidewalk. The world's first Street Piano was born. The accidental debut of the Sheffield Street Piano was a hit, and the instrument quickly became a local, then national, celebrity. Like any celeb, it had a period of thrilling ascendance, a splashy website, the occasional tussle with authorities (in the form of the Sheffield Council and its pavement obstruction laws), and a few newsworthy scandals, including being stolen in the dark of night, only to be replaced later by a group of committed volunteers. The Sheffield Street Piano survived for five years, and when it was finally removed due to weather damage, its model for urban harmony had gone viral. Sixty miles to the south in Birmingham, an enterprising artist launched his version of Street Pianos -- 15 instruments emblazoned with "Play Me I'm Yours," which then traveled to other cities as an "internationally touring artwork." Off the coast of Southern China on Gulangyu Island, Street Pianos enlivened a biennial piano festival. In the United States, towns from Jacksonville to Orange County have produced their own Street Piano installations, each one bringing its own flavor to the mix: surfing themes in Southern California's "OC Can You Play," an adventurer spirit in Denver's "Keys to the City," a Sarah Palin/George Bush impersonator duo heralding the Street Piano launch ceremony in central Florida (admittedly, I'm not sure what to make of that one). all artists involved donate their time and talent because of a shared belief in "art for all"
the pianos are part of a year-round continuum of arts outreach to communities in need. 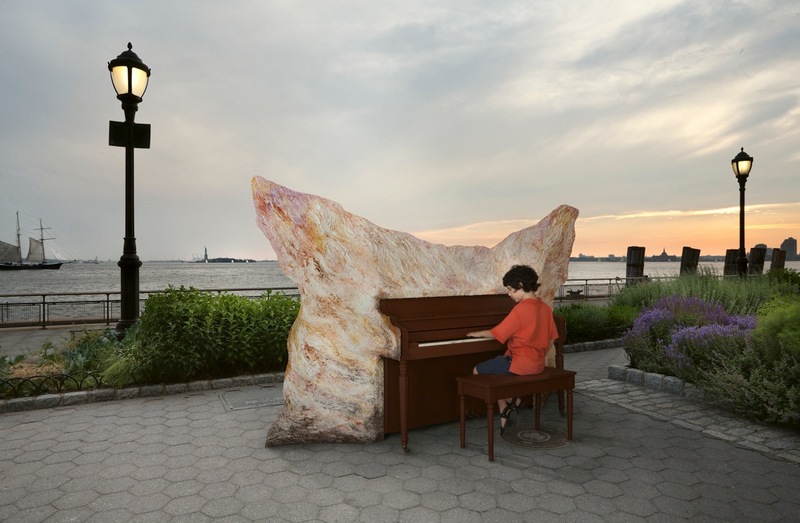 As an "artists' peace corps" powered by over a thousand professional artists who volunteer their time, Sing for Hope is uniquely positioned to produce a piano project worthy of the city that never sleeps. Year-round, we collect abandoned pianos from donors and wholesalers. Our technicians rehab the instruments in a beautiful sunlit studio in midtown loaned to us by a civic-minded real estate executive. Our favorite yogurt company, Chobani, "amplifies" the project through its incredible philanthropy and communal ties, and our generous Founders' Circle completes the funding picture. The piano artists work alone, in groups, and in collaboration with our students from New York City public schools. One by one, 88 instruments (one for each key on the piano keyboard) are brought to vivid new life. John Varvatos has created a nail-studded, hard-rock fantasia of a baby grand that channels his Detroit roots and the rough-hewn chic of the Lower East Side. Arianna Huffington and her team offer an intricately scripted piano that inspires viewers to "unfold your own myth." Girlometry, an arts collective of girlfriends who work in the toy design industry, have festooned their grand piano with street-inspired images in a funny, fresh style they call "ultra-girly." Robert Baird's piano features a series of minutely detailed doorways that represent the endless possibilities in our lives. Jennie Booth's "Think About How You Think" piano celebrates cognitive neuroscience through painted panels of dancing neurons -- her mysterious, musical reverie on "cogito ergo sum." The piano by the high school students of Sing for Hope's Youth Chorus reminds us in black-on-yellow letters that we must always "dream big." As the artists work their magic, the Sing for Hope team makes multiple visits to 88 sites throughout the five boroughs, and meets with city agencies and park managers to wrangle permits. We enlist volunteer "piano buddies" to cover the pianos with tarps in case of rain and report on missing keys and other occupational hazards. And in keeping with our year-round mission of arts outreach, we lay the groundwork to donate the pianos to schools, healthcare facilities and community organizations after their public tour of duty. This Saturday, the 88 Sing for Hope Pianos will move out of their studio and into the streets, from Grand Concourse in The Bronx to the greens of Battery Park and from Coney Island to Far Rockaway, where they will be enjoyed by an estimated 2 million people. The Sing for Hope Pianos are a whimsical way of saying something serious: art belongs to everyone. The pianos will inspire melodies, conversations, uploads, and random acts of musical kindness -- including, hopefully, yours. And we hope they will inspire imitators in cities around the world for years to come. To quote Hugh Jones, who started it all on Sharrow Vale Road a decade ago, "Perhaps one day, Street Pianos will be a familiar sight everywhere. Now wouldn't that just rock your world?" This post is part of a series produced by The Huffington Post and Sing for Hope, to mark the latter's Sing for Hope Pianos project and its mission of "art for all". For more information, visit www.singforhope.org.